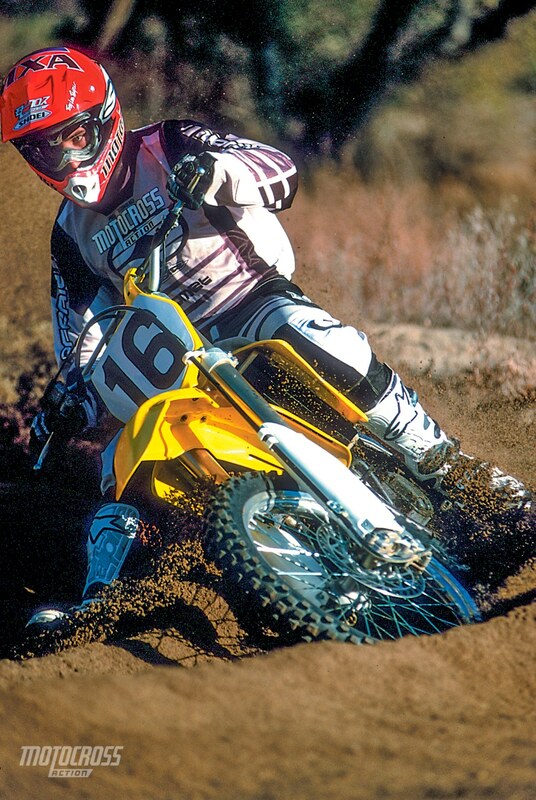 This test is from the 2001 February issue of Motocross Action Magazine. 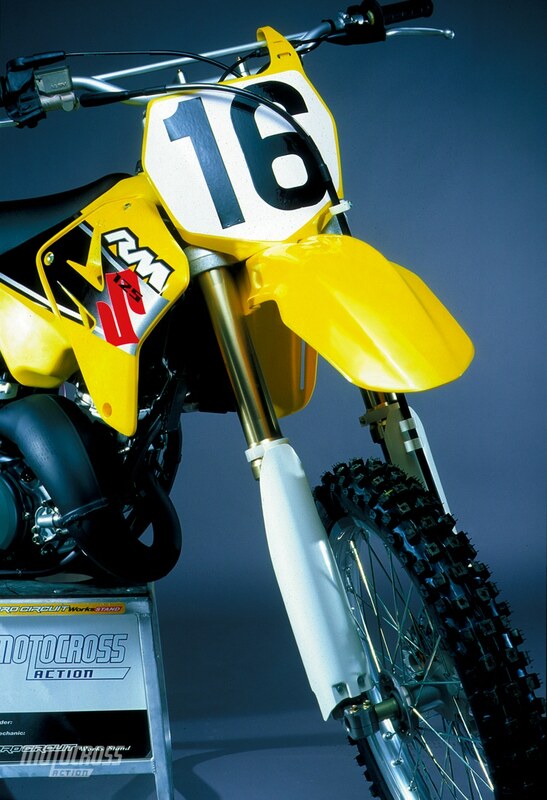 QUESTION ONE: IS THE 2001 SUZUKI RM125 FASTER THAN THE 2000 RM125? 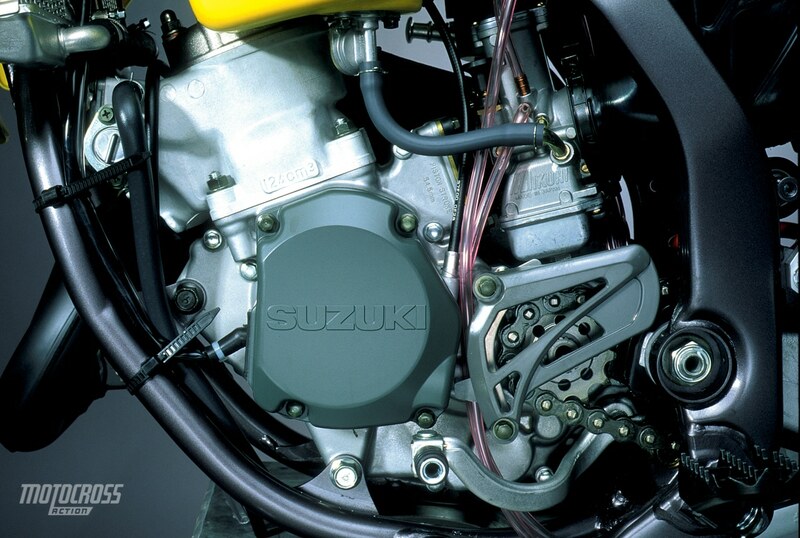 If it wasn’t Suzuki would have wasted a lot of money designing an all-new engine. The 2001 is faster than the 2000, but that wouldn’t be too hard to accomplish — the 2000 engine was fun to ride but produced very little horsepower. And by very little we mean about two horses less than the class leader. The 2001 engine is still fun to ride, but now makes horsepower–not as many ponies as the fastest bikes in the class, but darn close. Over the years Suzuki resisted the urge to jump on the Yamaha YZ125 powerband wagon. They stayed their course. What is the RM125‘s niche? Rev over grunt. To make the most of the RM125 powerband you have to be comfortable living at 12,000 rpm. 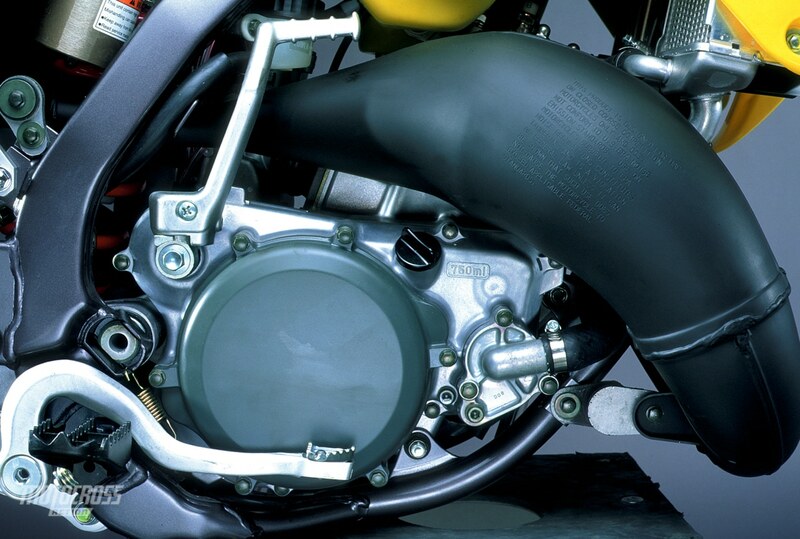 The 2001 RM125 has almost limitless rev. QUESTION TWO: WHAT’S NEW WITH THE RM125 ENGINE? What isn’t? Here’s the short list of changes: (1) The engine cases have been downsized. (2) The water pump is back on the outside of the engine. (3) The cylinder sits at a 17-degree angle instead of last year’s 20-degree angle. This allows for a straighter intake tract. (4) Last year’s Keihin carb has been replaced by a 38mm Mikuni TMX—yes, we said 38mm. (5) The ignition black box is lighter. (6) The shift shaft has been hollowed out. (7) The diameter of the ignition rotor has been decreased by 4mm. (8) Crank mass is redistributed to compensate for the smaller ignition rotor. (9) The exhaust port is wider and reshaped (after being shrunk last year for durability). Suzuki closely examined every part to see if weight could be saved. In the end, the engine lost almost two pounds. The 2001 engine is faster than the 2000, but that wouldn’t be too hard to accomplish–the 2000 engine was fun to ride but produced very little horsepower. QUESTION THREE: WHAT’S THE RM125’S BEST ATTRIBUTE? (1) The most obvious choice is to catch gears in the meat of the midrange and try to ride the wave. It might be the logical option, but in our opinion it’s risky. If you try to ride the RM125 in the midrange, as you would a Honda or Kawasaki, the RM125 will fall flat on its face when you shift to the next gear. (2) The second choice, is actually, the best choice. Rev it to death. Wring its little guts out. Hold it on long and hold it on hard. Once the RM125 engine hits in the midrange, hold the throttle wide open until you can’t take it anymore—then, and only then, shift. QUESTION FOUR: WHY DOES THE RM125 REV SO HIGH? Because they designed it to. KTM, Yamaha and Suzuki have all made conscious decisions to go for high-rpm rev by mounting big carbs (carbs that would normally be OE on a 250). The side effects of super-sizing the carb on a 125 is a loss of low-end (witness the 2001 KTM 125SX and Yamaha YZ125). Big carbs don’t become efficient until the revs are high enough to create sufficient fuel velocity (this doesn’t happen until the dogs start to howl). A lot of factors go into making the big carb work. 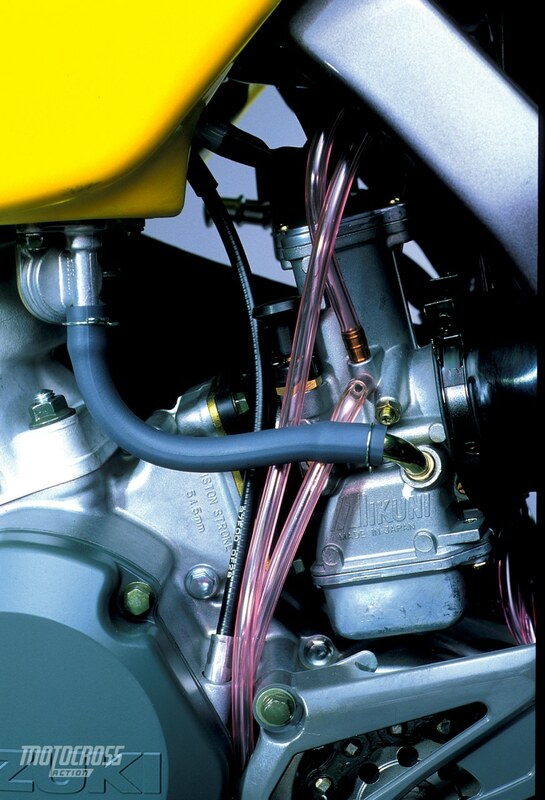 Suzuki uses a high-rpm ignition curve (with the advance tilted to the top-end) and a small reed cage inlet size (to aid in increasing fuel velocity). The end result is a 125 that rivals the rpm of an Indy Car. The 2001 Suzuki RM125 revs really high because of its big carb. QUESTION FIVE: IS IT THE FASTEST 125 OF 2001? Heavens no. In our opinion Yamaha and KTM still outshine the RM125, but it’s a big improvement over last year’s anemic RM125. QUESTION SIX: HOW GOOD IS THE GEARING? Atrocious. Two years ago Suzuki had 12/50 gearing on the RM125. They switched to 13/49 for 2000. Now, in 2001, it has 12/49 on it. Forget second gear turns, let alone second gear starts. Save yourself a lot of trouble and gear the RM125 down. We had our best luck with two more teeth on the rear sprocket. If you don’t gear it down—it will fall off the pipe with regularity. Stock gearing on the RM125 is horrible. It needs to be geared down. QUESTION SEVEN: WHAT ABOUT THE JETTING? Suzuki’s engineers came to the conclusion that the RM250‘s suspension woes may have been caused by Showa—so they threw Kayabas at it. Surprise! It’s still jacked up. Even more surprising was that Suzuki decided to stick with Showa components on the RM125–and it is pretty good. 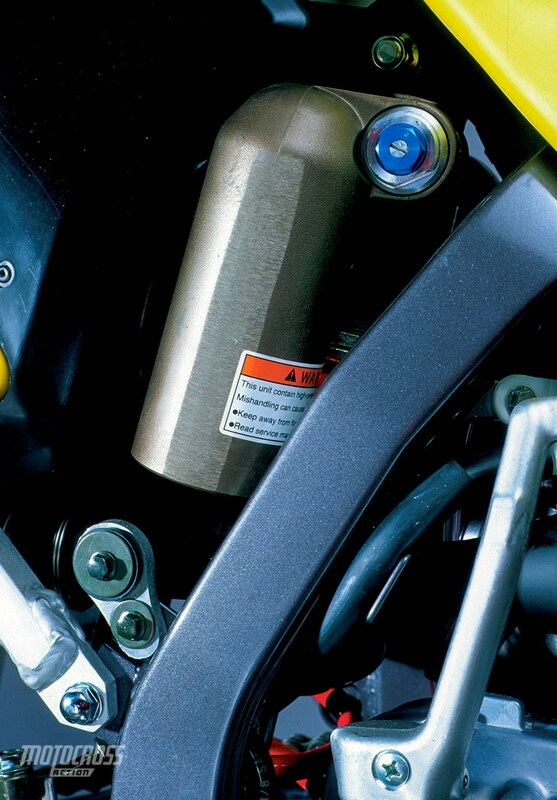 We won’t say the rear suspension is perfect, but it is more race-ready than any RM125 since ’95. It still has a slight tendency to blow through the stroke (only this year it will take a much harder landing or bigger bump). We spent most of last year hating the progressive-rate rear shock spring. Thankfully, Suzuki saw the light and switched to a straight-rate 4.8 kg/mm rear spring for 2001. QUESTION NINE: WHAT WAS OUR BEST SHOCK SETTING? Notes: Spring choice depends on rider weight and speed. We chose a 5.0, but smaller riders can stick with the stock 4.8 (depending on their speed). QUESTION TEN: WHAT ARE THE BEST FORK SETTINGS? It should be noted that Showa switched their fork diameter from 49mm to 47mm for 2001. The downsizing may not make sense to you, or to the MXA wrecking crew, since Suzuki’s race team runs even larger 50mm tubes, but Suzuki believes that the new lighter frame and steering geometry work better with the smaller diameter fork tubes. Notes: Slide the Suzuki forks up and down in the triple clamps to alter the handling (down for more stability and up for sharper turning). When working on the forks, please note that Showa doesn’t measure fork oil height in millimeters, but rather in cubic centimeters of fluid. Better than last year. Suzuki has a rep for building “cornering machines”—a reputation they have worked hard to keep in spite of beaucoup criticism. 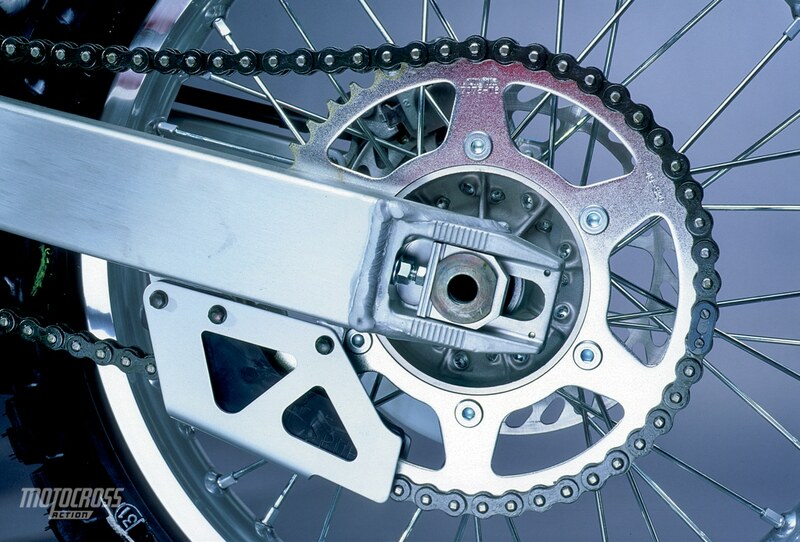 To keep the RM agile, Suzuki changed the head angle from 27.75 to 26.5 degrees. Very risky! The RM125 has always been twitchy and the head angle change could easily have sent the RM125 into a graveyard spiral. But, it didn’t! The new head angle was combined with totally new frame (one that is more resilient) and the whole package got better. The RM125 is still a carving knife, but now it’s a steady one. If we had to race on a Supercross track this is the bike we’d do it on. No other bike feels as good in the air, in tight turns or on hard ground, but there is one caveat: As swift and agile as the RM is on a Supercross track, it is busy and loose on an outdoor track. (2) Plastic: It may be light, but it came at a price. This is the thinnest and flimsiest plastic we’ve ever seen. (3) Jetting: Fat on the pilot. (4) Clutch: The Suzuki clutch runs on the verge of perpetual slip. This is a marginal clutch at best. (5) Gearing: So bad it’s embarrassing. (6) Graphics: Buy aftermarket graphics before your leave the showroom floor. You’ll need them after the first ride. (7) Reliability: We’d rate Suzuki’s durability last after Honda, Yamaha, KTM and Kawasaki. (1) Ergos: For years it seemed like RM’s were only designed for small people. Finally, taller riders will feel at home on the 2001 RM125. (2) Front brake: Suzuki has an excellent front brake (if you don’t mind a little squeaking). (3) Shock spring: We’re happy to see Suzuki dump the progressive-rate spring for a straight rate. The rear suspension is much improved. (4) Color: The pale yellow has its detractors, but it stands out. You have to give Suzuki props for going all out in 2001. They spent mega bucks redesigning both the RM250 and RM125. How successful were they? One out of two ain’t bad. 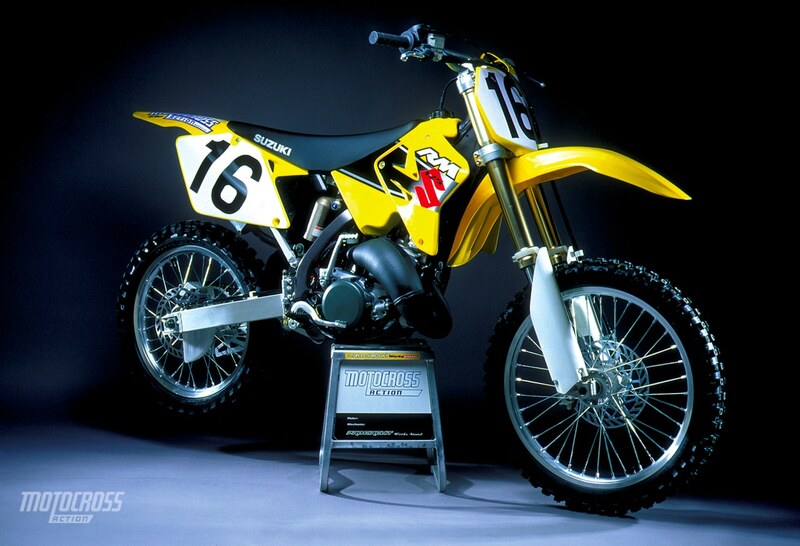 Suzuki struck out with the RM250, but with the RM125 Suzuki hit a home run.